Weber� have livened up their gas barbecue range by making the Q1200 available with a choice of Blue, Green, Purple, Fuchsia, and Orange coloured lids to inject more colour fun into the grilling experience. The Weber� Q1200 Green is a portable, ready to go barbecue, which is perfect for days out and weekends away being small enough for the boot of a car, but plenty big enough to feed four people having everything you would expect from a portable barbecue by a manufacturer of gas barbecues with a reputation such as Weber�'s. Perfectly equipped and portable for adventures yet perfect for use at home the Weber Q1200 Green is powered by Weber� 445g disposable gas canisters making it ideal for those who want to grill where ever they may be, though accessories can be purchased separately to connect the barbecue to a refillable Patio Gas bottle. Sharing many features with it's sibling, the Weber� Q1000, the Weber� Q1200 Green has the addition of a taller lid profile with built-in thermometer, for greater roasting capabilities, with three convenient utensil holders located at it's front, not forgetting the two fold away side tables. The Weber� Q1200 Green is constructed with a cast-aluminium lid and body which sits in a heat resistant glass re-inforced nylon frame, which has built in carry handles, materials which are chosen for their ideal combination of lightweight, durability and resistance to bashes and crashes. Beneath the frame there is space to easily access the removable, and disposable, drip tray which collects surplus fats which have not been recycled back into the cool box as part of the grilling process. The frame simply clips onto, to use in conjunction with, the ingenious quick folding Weber� Q Portable Cart, separately purchasable, for even great versatility. This can be used as both a grill stand, raising the grill to the right cooking height, or as a pull along cart to transport the Weber� Q1200 Green over all but the roughest terrain to locate the grill on the beach or in the wild. The push-button function allows you to quickly fold or unfold the cart with your grill securely in place and make for an easy fit into a car boot or for storage. At the heart of the cook box of the Weber� Q1200 Green sit the porcelain enamelled cast iron cooking grates, chosen for their heat retention properties and ability to withstand every day grilling abuse, giving a surprisingly large 1355 cm cooking area. These sit above the Q-shaped stainless steel burner, which gives the Q range it's name, which is designed to maximise the heat output to the greatest grilling area while helping minimise the bulk and weight of the Q series barbecues. The infinite control burner valve regulates the gas flow into the burner so the grilling process can be manipulated according to whatever is being cooked for ideal results every time the Weber� Q1200 Green is fired up. Simply use the electronic ignition to light the gas going to the burner then away you go. Weber� produce a huge variety of accessories both to re-invigorate ageing Q series barbecues and widen the range the cooking options , and make life simpler, for owners of the Weber� Q1200 Green with well designed and thought out easy to use items from essentials such as lightweight utensils, cleaning brushes, and covers to repertoire expanding roasting racks and shields. 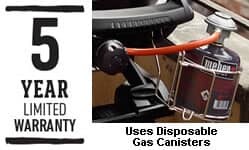 Uses Weber� 445g disposable canisters � hose and regulator to connect to refillable Patio Gas bottle available to purchase separately. There are currently no reviews for this product Click here to add your review to be the first to review the Weber� Q� 1200 Green Barbecue.